I am a pet mom, among many other things. I love to share my life and home with animals (and my hubby, of course). Most of my pets are user friendly, except two. Lily, our little bitty dog who thinks she is a Rottweiler, is a story for another day. And then there is Rufus, our African Grey Parrot. Parrots are very destructive, by nature. They love to tear up things that they find interesting, like computer cords, phone cords, cabinets, woodwork, lazy boy chairs, and anything else they see. I give Rufus lots of things that are OK for him to destroy, like cardboard boxes, rope, sticks, cloth, shoelaces, etc. They are inside and on top of his house. I rotate them so there is always something new to play with. 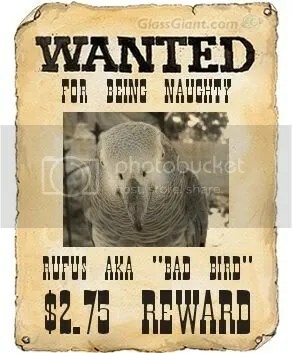 But, Rufus has a naughty streak, and he has a strong preference for having his way. So, here’s how it goes. I hate to see animals in cages, even huge cages like Rufus has. So first thing I do in the morning is open Rufus’s cage door. The exercise in futility is getting him to understand that he is allowed to do anything in and on top his big cage, but the second his foot touches the floor, back into his house he goes. He is getting better and better at listening to me. He knows Mom means business, but he doesn’t much care. He wants to try to do things his way, even for a second, no matter the outcome. So, I warn him when he is climbing his way down his cage. I tell him: “Rufus, you are going in your house!”. I lean forward in my chair, and get ready to stand up. Finally, after months and years of this, Rufus decided that he would rather play on top of and around his house than be locked in. He will turn around and start climbing up his house… MOST of the time. But, still, once a day, he has to put his foot on the floor, and back into his house he goes. He gets a lot of interaction with me and my hubby in the evening, but I want him to be able to play alone without constant supervision. So, right now, Rufus is climbing around, doing laps around the sides of his house. I make sure to give a LOT of positive reinforcement when I see him being good.